Craving a sweet frozen treat? You may want to think twice about choosing products from ice cream and frozen dairy desert maker Breyers if you believe food companies owe consumers honesty in marketing. 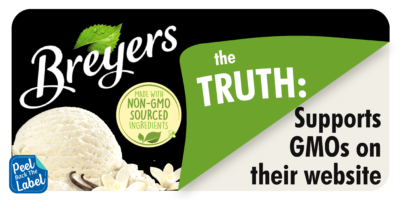 Here’s why: Even after acknowledging the overwhelming scientific consensus confirming the safety of GMOs, Breyers still decided to label some of its products as “Made with Non-GMO Sourced Ingredients.” The reason? An effort to meet “consumers’ preferences,” according to the company. On top of that, the standard Breyers sets for when they use the “Non-GMO Sourced” label makes it even more worthless to discerning consumers. That’s because, according to the company’s website, tthe “Made with Non-GMO Sourced Ingredients” label is used even when there are no commercially grown GMO varieties of that ingredient available. Most consumers’ would probably agree – their “preference” is for food companies not to mislead and deceive them in an effort to sell more products. But that’s exactly what Breyers is doing. By adding a “Non-GMO” label to their products, Breyers hopes consumers will believe their product is superior to others in the ice cream case – even when there isn’t a genetically-modified ingredient to speak of in the first place. Enough is enough. Tell Breyers to STOP deceiving consumers with their misleading labels and fear-mongering marketing by contacting them on Twitter, Facebook and email. See why experts, advocates and more agree, it’s time to peel back the label on deceptive food marketing. Funny Or Die: All-Natural, Non-GMO, 100% Gluten Free Internet Video!